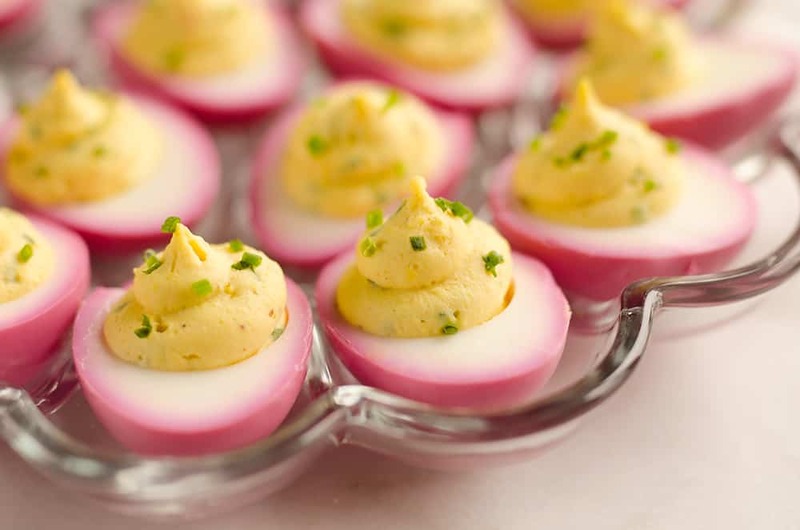 Pink Pickled Deviled Eggs are a beautiful side dish or appetizer perfect for your holiday table. Hard boiled eggs are lightly pickled in beet juice and vinegar for the unique color that is sure to impress your dinner guests! 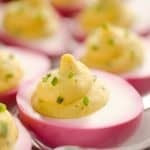 Deviled eggs are one of the best things about Easter and these Pink Pickled Deviled Eggs are a fun and beautiful twist on the classic! It seems like it is the only time of year they are ever made, which is really ashamed. This only makes them that more beloved when they do come around though. 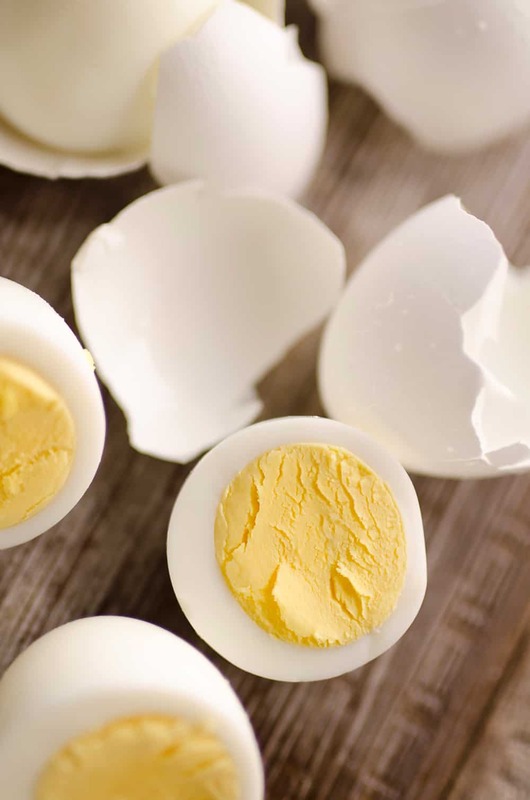 To make your hard boiled eggs as easy as possible, try cooking your eggs in your Instant Pot! I will never forget the first Easter I attended with my husband’s family. I happily plopped two deviled eggs on my plate and went on my merry way through the vast buffet of food. As I sat down, I dug right into the deviled eggs with a large bite but was immediately taken aback. Instead of the tangy vinegar flavor I was anticipating, I was struck with the sweetness of sugar. WHAT?! 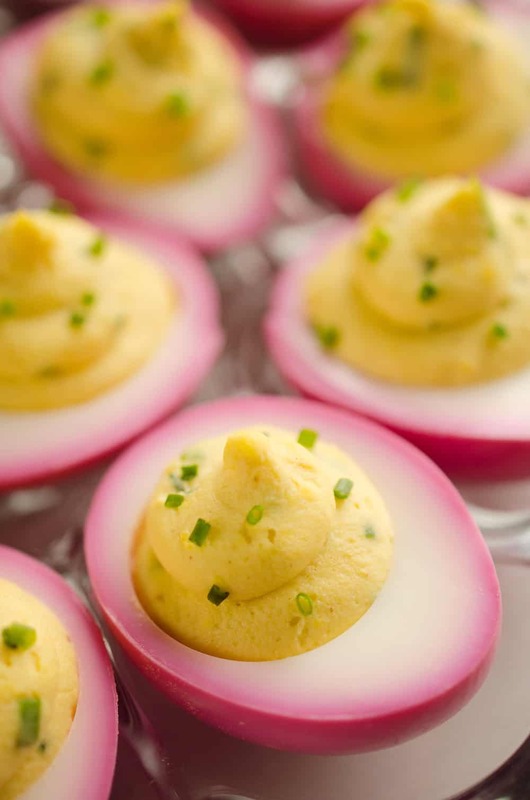 Who makes sweet deviled eggs and how is this even a thing? I quickly elbowed my husband and shuffled the eggs over to his plate. I literally couldn’t eat another bite. It was just wrong on every level. Ot was a complete abomination of deviled eggs I tell you! Needless to say, there is an ongoing debate between our families as to how deviled eggs should be made. Everyone tries to be accommodating, so when I go to his family they add vinegar to a few eggs for myself and my mom makes sure to make a few sweet ones for my husband when we are there. 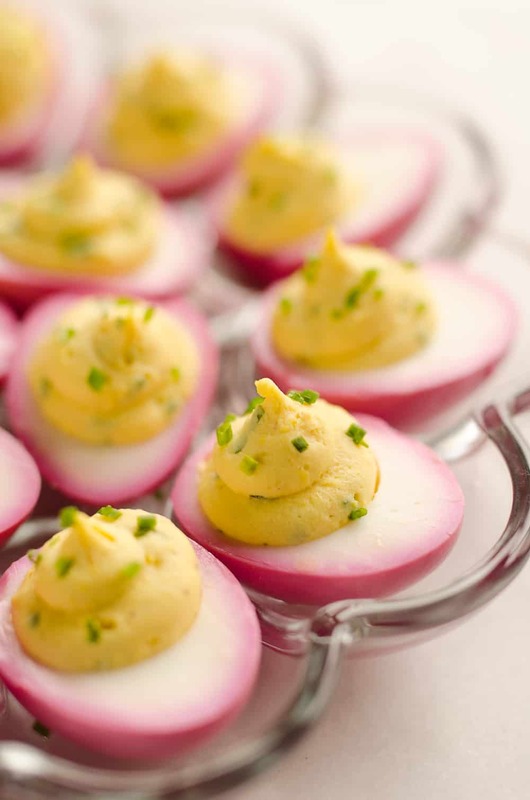 My mother and I are both passionate about our love of vinegar and these Pink Pickled Deviled Eggs are the perfect combination of tangy vinegar and the gorgeous fuchsia color. Although I don’t actually like pickled beets, the juice from them is the secret ingredient which brings the amazing color to the dish. You honestly don’t taste the beet flavor much at all. My husband on the other hand is a seirous pickled beet lover. My mom actually gave him a few jars of homemade pickled beets for Christmas as a joke. When you are pickling your eggs, keep in mind that the longer you pickle them the deeper the color will get and the more sour they will become. The eggs will also start to change texture if you leave them much longer than a day. I found the ideal amount of pickling time for the right flavor and color is around 12-20 hours. 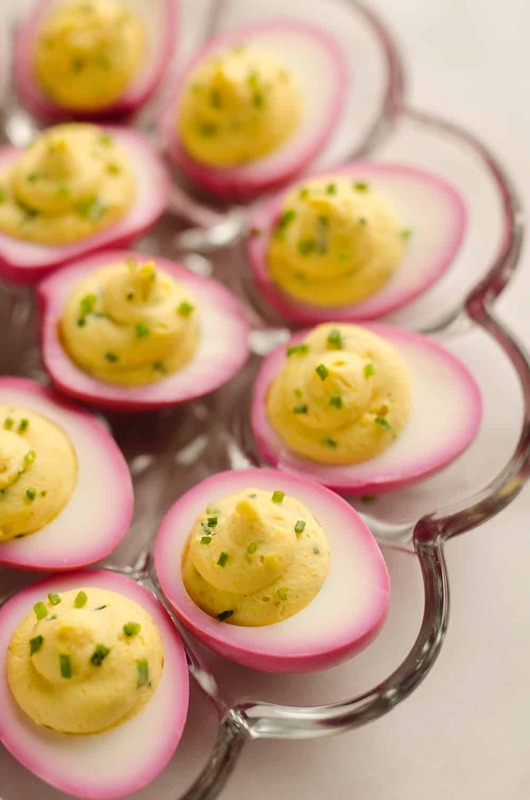 Pink Pickled Deviled Eggs are a beautiful side dish or appetizer perfect for your holiday table. 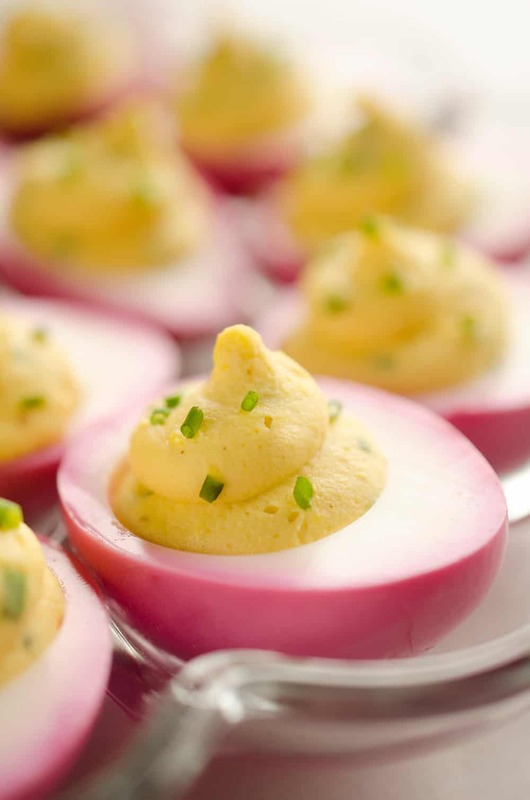 Hard boiled eggs are lightly pickled in beet juice and vinegar for the unique color that is sure to impress your guests! Add the pickled beet juice, apple cider vinegar and peeled eggs to a jar. Refrigerate for 12-20 hours. Remove the pickled eggs from the jar and rinse quickly under cold water. Place on a paper towel. 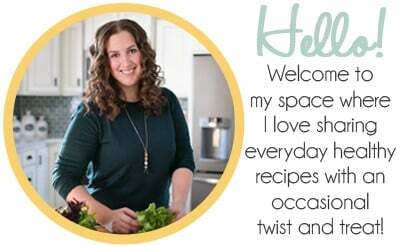 In a small bowl add the egg yolks and using a fork break them into fine crumbs. Add the mayo, Dijon, honey, salt and 1 Tbsp. chives. Continue stirring vigorously with the fork until smooth. Add the yolk mixture to a plastic bag. Snip the corner of the bag and pipe the mixture into the egg whites. Garnish with the remaining chives. 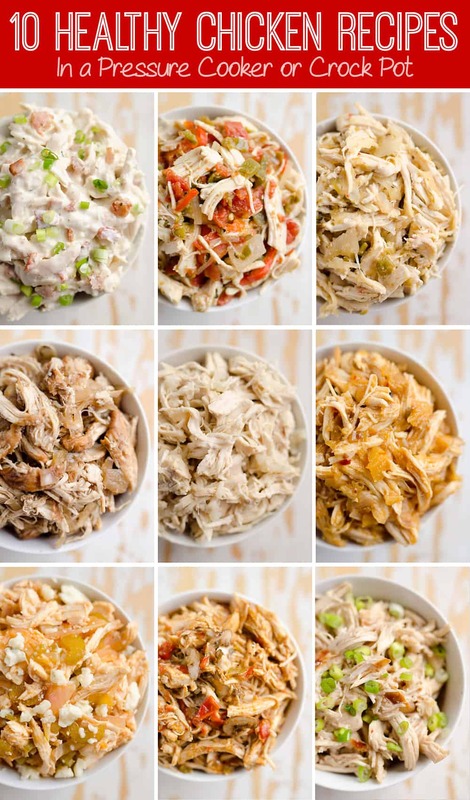 Serve immediately or store refrigerated for up to 3 days.